Household pests like cockroaches, ants, and rodents can be an annoyance, not to mention unhealthy. Knowing the signs of a pest invasion can allow you to catch the problem early. Tri-County Pest Control will assess your home and exterminate the problem. Don't let pest problems at home make you lose sleep. Tri-County Pest Control provides year-round prevention services for roaches, spiders, beetles, termites, and other home invaders. You can count on Tri-County Pest control for reliable, effective pest prevention services. Our pest control services are safe for your children and companions. We use treatment standards based on EPA guidelines and by the manufacturer's suggested mixture dependant on the level of infestation of the home. Serving Tupelo and the surrounding areas since 1993! The pest control technicians at Tri-County Pest Control are trained and certified in all aspects of pest control and extermination. Each technician is required to maintain active certification and continued education, keeping them up-to-date and knowledgeable on the pest treatment. Our pest control technicians have been with us for many years, we are all family, and you are our neighbors. You can rely on our experienced technicians to be friendly and able to answer questions you may have about your services or issues you may be seeing in your home. We do our best, to offer our clients, a pest free environment, at an affordable price. We are known for, and you can rely on us providing effective services. If at any time you are not happy, we will do everything to make it right. If you aren’t happy, we are not happy. 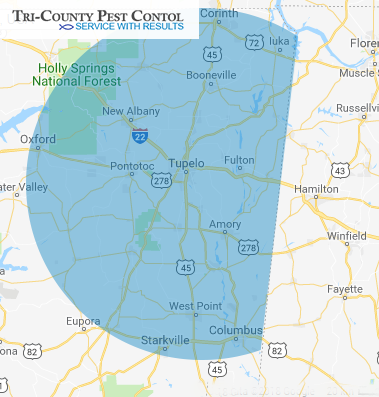 With over 25 years of pest control experience, family-owned Tri-County Pest Control has the knowledge and over 150 years of combined expertise needed to successfully eradicate any pest issues you are facing. We will give you peace of mind knowing that your problem is in the hands of industry professionals who can handle these issues quickly and efficiently. As a locally owned and family run business, we will always be here to take care of our customers - previous clients know that our company truly cares about each person we provide service for, and they continue to recommend us to others. Our qualified, trained technicians use state-of-the-art methods and tools to quickly eradicate pest problems and prevent reoccurrence. Each pest control plan is customized to reflect the level and type of infestation, size of your home, and prevention goals. We do our best to work around your schedule and minimize the inconvenience for your business or family. Put your mind at ease and let family owned & operated Tri-County Pest Control handle your pest issue quickly and efficiently. Call us at (662) 840-1163 and schedule your free inspection today. We proudly serve customers in Tupelo, Belden, Verona, Saltillo, Guntown, Pontotoc, New Albany, Fulton, Corinth, Booneville, Amory, West Point, Oxford, and everywhere in between. Using the wrong elimination method or having inexperienced people treat your home for pests can result in wasted time and money and allow further damage to your home. For reliable pest control services, people trust the qualified professionals at Tri-County Pest Control to do the job right: we understand how important your home is to you, and we are committed to eradicating any pest issues immediately. Our trained, certified, and experienced staff will create a customized pest removal plan that reflects the area and level of infestation, size of your home, and long-term prevention goals. We will also set up plans for pre-treatment of your home to prevent infestation from occurring. Moving into a new home is exciting. Pests can hide well and often evidence is cleaned up prior to seeing the home. Schedule a pest treatment prior to moving in. We will treat for common pests and look for evidence of other pests that may be in the home.